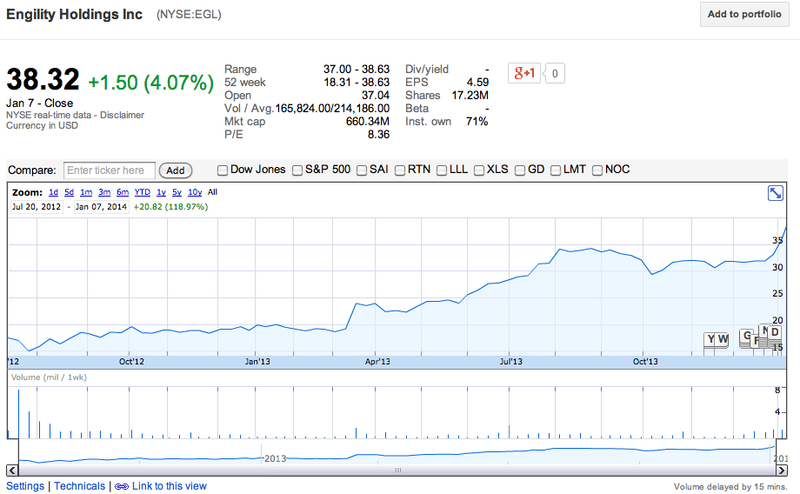 Exelis Mission Systems Spinoff - Replay of Engility? One ignored spinoff that I wrote up last May was Engility Holdings, a pure play government services provider that was cast off by L-3 Communications as a low profit margin, decreasing revenue business that was meant to highlight the parent company's higher margin businesses and earn a higher multiple in the market. Despite Engility's debt, small size in relation to the parent, and several government budget showdowns, since the spinoff in July 2012 it is up well in excess of 100%. Unfortunately, I never got around to investing in it at around $25 back in the spring, a missed opportunity that I'm still kicking myself over. However, in December, Exelis (itself a spinoff from ITT Corporation) announced that it was spinning off its government services business in the summer of 2014. In their recent investor presentation Exelis lists many of the same reasons for a spinoff as L-3 Communications did with Engility, basically the government services business is masking the overall growth and profitability of the core businesses. Luckily for the future spin-off, thus far nameless, Exelis will be keeping the pension benefit liability, but the spin-off looks like it will be saddled with debt similarly to Engility post-spin. The government services business should be able to support significant debt due to the predictable cash flows, low capex requirements, and variable cost structure (Engility made significant progress in refinancing and paying down debt in 2013). 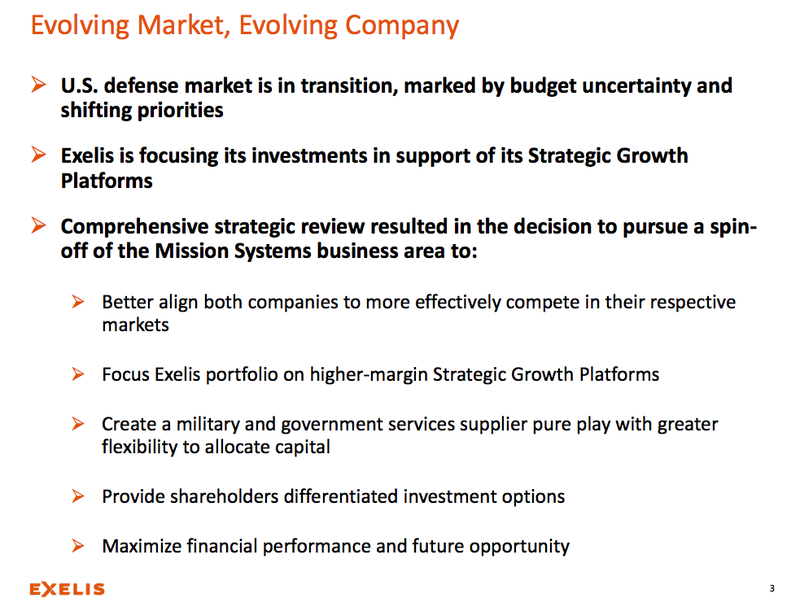 There's limited information so far on the spin, but the Exelis Mission Systems business seems to be a near mirror image of the Engility/L-3 situation (even similar revenue and employee size). The environment has changed a bit, the budget deficit has retreated from front page news, the overall market is way up, but I think you could see some selling pressure and a lack of coverage that could make the spinoff undervalued post-spin. I'm keeping it on my watch list and will do a deeper dive once the filings come out.